HostGator vs. iPage Comparison (2019) - Here's the Winner! Home » Hosting Reviews » Hosting Comparisons » HostGator vs. iPage Comparison (2019) – Here’s the Winner! HostGator vs. iPage Comparison (2019) – Here’s the Winner! Looking for the best hosting service? iPage and HostGator are 2 of the best hosting providers out there. 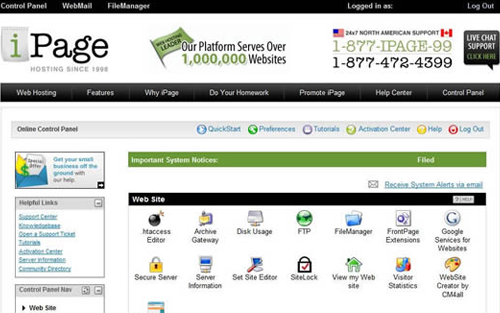 But which is truly the best web hosting service: iPage or HostGator? Not every web hosting service is created equal. It’s important for you to understand how these 2 hosting providers differ from each other, regarding their pricing plans and features. With our unbiased comparison between HostGator and iPage, we’ll help you decide which one is the best choice for you. Both HostGator and iPage are hosting brands operated by Endurance International Group, a renowned web hosting company. HostGator is geared towards providing a wide range of different hosting options and services. They offer hosting options that iPage doesn’t offer, including cloud hosting and reseller hosting. Conversely, iPage is focused on delivering the most affordable hosting plans in the industry that fit every budget and requirement. Their web hosting plan starts at $1.99 per month, which includes a free domain name and SSL. Without a doubt, speed and uptime are the most important factors you need to consider when choosing a web host. To test whether HostGator and iPage actually live up to their hype, we decided to analyze their page speed and uptime guarantees by signing up with each of them and creating 2 test sites. To mirror the live environment on our test sites, we installed a WordPress theme, published dummy content along with some images. Pingdom: To analyze the website speed. Load Impact: To monitor how these hosting servers handle a traffic surge on our test sites during a peak load time. Bitcatcha: To figure out how these hosting servers would perform from 8 different geographical locations. According to our Pingdom speed test, our HostGator site took 691ms to load when tested from Dallas. However, our iPage test site was loaded in 2.6 seconds and was faster than only 60% of tested websites, but way slower than our HostGator site. According to Load Impact, our HostGator server responded quickly until there were about 80 visitors at a time. When it comes to iPage, the response time was slow when there were about 50 users on the site. After that, the page speed remained stable despite having more live users. According to Bitcatcha test, HostGator server was rated C, whereas our iPage site was rated C+. 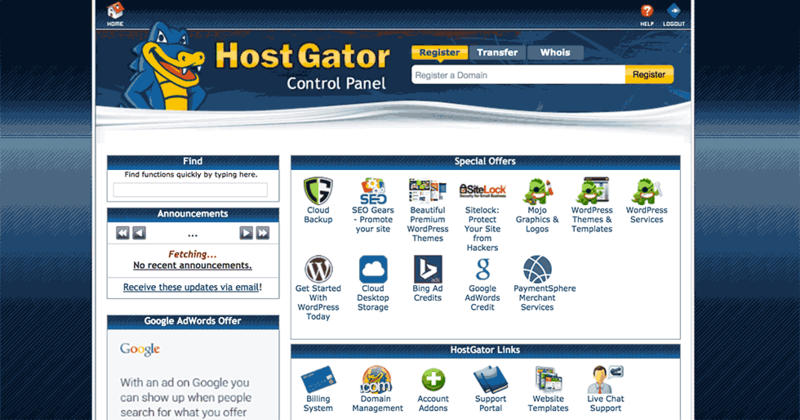 All hosting plans from HostGator come with cPanel for managing your web hosting accounts. 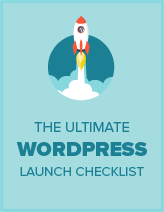 They also offer 1-click installers for popular website scripts, such as WordPress, Joomla, and Drupal. On the other hand, iPage doesn’t offer cPanel. Instead, they offer their own customized version of a control panel which they refer to as vDeck. However, if you’re accustomed to cPanel, which is the most popular web hosting control panel, then there’ll be a bit of learning curve to tackle before using vDeck. Both of them also provide a website builder developed in-house to users who want to build a site without having to hire a developer. With HostGator, you get everything you need to kick off your new site from the ground up. Whether you want site builder tools or one-click application installer, SEO tools or backup solutions, HostGator has got you covered. They also offer a 45-day money back guarantee to try out their hosting service risk-free. However, when it comes to features, iPage stacks up against HostGator. One-size-fit-for-all plan: iPage offers only one shared hosting plan, which allows you to host unlimited websites, whereas, with HostGator, you’ll have to sign up for an expensive plan for unlimited website hosting. Free domain name: When signing up for a hosting plan, get a free domain name with iPage. Both HostGator and iPage offer 24/7 expert assistance when in need via phone, chat, and ticket-based email. Their knowledge bases are pretty straightforward, without fluff, so you can easily resolve web hosting issues on your own. Here’s a head-to-head comparison between the pricing of different hosting options from HostGator and iPage. HostGator $2.78 /mo. $5.95 /mo. (Cloud) $4.95 / mo. $19.95 / mo. $119.00 / mo. iPage $1.99 /mo. $3.75 /mo. - $19.99 / mo. $119.99 / mo. As you can see, iPage’s introductory plans are way cheaper than that of HostGator. If you’re looking for affordable shared or WordPress hosting plans, then you might want to consider iPage. iPage doesn’t offer Cloud or reseller hosting. The pricing for VPS and Dedicated servers offered by HostGator and iPage are almost the same. After our comparison, we believe that HostGator is a better hosting company than iPage. Not only HostGator provides more hosting options, but also offers a vast array of tools to easily launch a website from the ground up. HostGator always strive for excellence by constantly upgrading their infrastructure as well as user experience. While iPage comes with 30-day money back guarantee, HostGator lets you try their service for 45 days risk-free. We hope this article helped you find the best web hosting provider for your site. If you enjoyed this comparison, check out our HostGator review and iPage review.